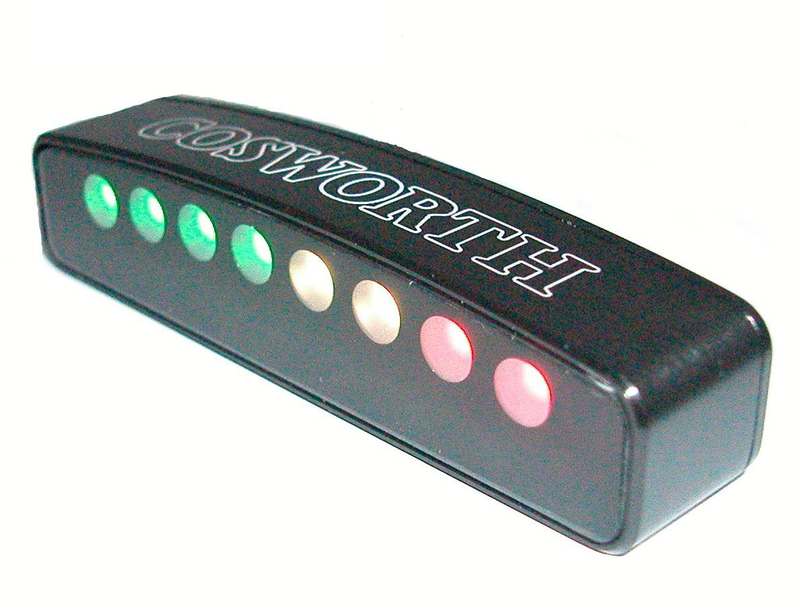 The Cosworth CLM is a compact multi-colour LED module designed for use applications where it is essential to display unobstructed information to the user. The CLM can be or mounted singularly or in pairs either horizontally or vertically and typical uses include a remote shift light module, to display wheel spin/traction control per driven wheel, tyre temperatures/pressures, brake bias or displaying alarms and other system statuses. The first variant of CLM, the CLM-8, has 8 tri-colour LEDs all of which can be independently controlled for state (on/off) and colour via a single CAN message. Each LED can be set to one of 7 colours and the CLM is designed to be compatible with the standard Cosworth brightness CAN message, meaning LED brightness can be controlled from a single source. Using Cosworth’s extensive experience in design of high end displays, the CLM features an internal LED diffuser to allow for a seamless transition between colours and to give maximum visibility though our tried and tested reverse screen-printed window. Great care has been taken to ensure the unit is IP65 rated – providing the ability to use in both open and closed cockpit environments. An internal Debug connector gives direct access to configure custom CAN ID’s for both Tx and Rx as well as frame rates. It is also possible to set the CAN BUS rate and system termination. Extensive display of information is possible through the use of multiple CLM’s connected to the same CAN BUS. The CLM is available in a flying lead (-FL) or terminated with an Auto-sport connector (-ASL). The CLM can be mounted using either two M3 fitting holes provided in the base of the unit or the two rear backplane fixings, providing essential flexibility for mounting.